So, while my Sunday started off like a normal day, it certainly did not end like one. I supervised a student at his church. I came home, had breakfast, then rested a bit before our evening Eucharist. About five minutes before my alarm sounded to remind me to go to chapel, a student knocked at the door. He was out of breath, and informed me that everyone was fine, but there had been an accident. It took my mind a few minutes to catch up. I had lent my car to a friend to go down into Mukono town to go to the supermarket. The student indicated that the accident was just down on the road. I surmised that he had run up the hill to tell me to come. When I went down to investigate, the car had indeed jumped the curb and gone down an embankment, resting on its side next to the Noll block. That’s my car, just taking a nap next to the Noll block. The splatter on the inside of the windshield is yogurt. I’m assuming that the passengers got out by climbing out the window. 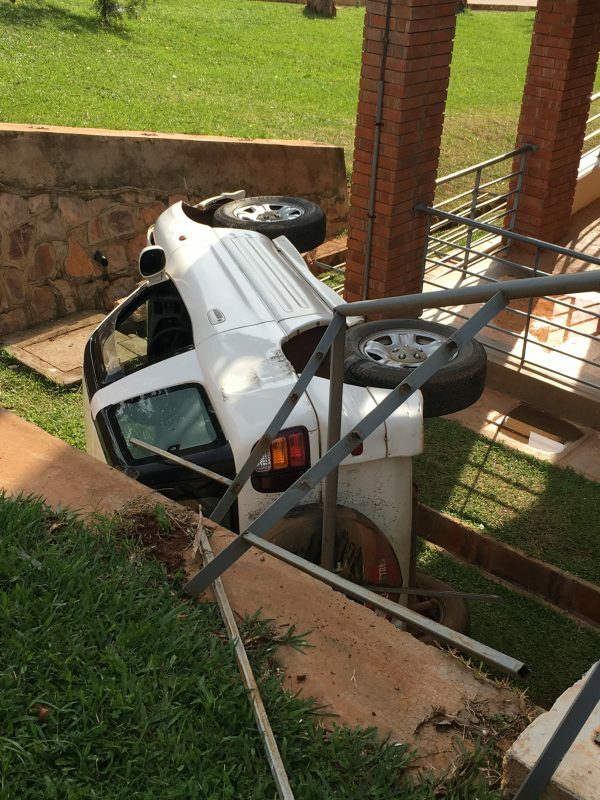 Despite the car being injured (and the handrails), I see so much grace in this. Thank God that no one was hurt: there had been four people in the car. Thank God that neither the building, nor the retaining wall, was damaged. Thank God that the askaris (security) were super helpful. Thank God that the traffic police officer was willing to come to campus to take the statement and start the report so that we didn’t have to find our way there. Thank God that the crane operator was close, and came in about 20 minutes. 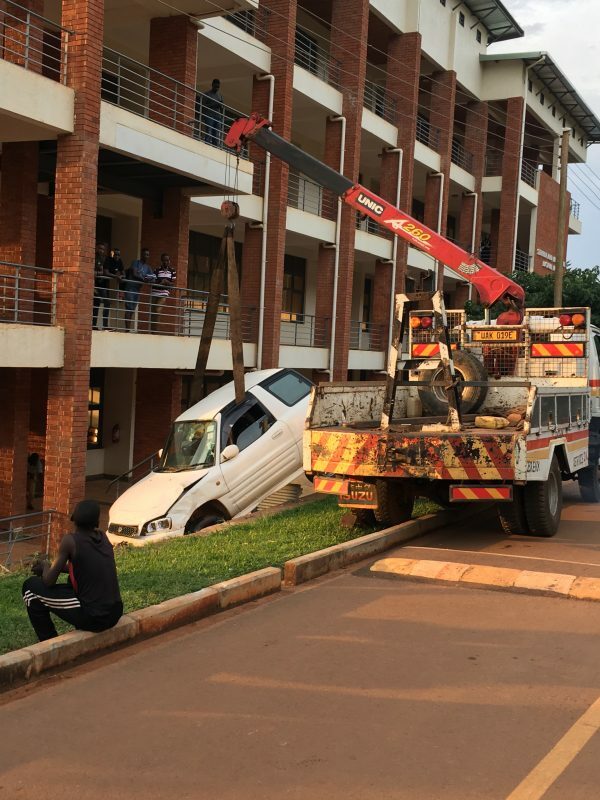 Thank God that the UCU mechanic and the askaris insisted that the car sleep (stay) at UCU at Tech Park; who knows what would have happened to the car if it left campus. It was quite fascinating to watch the crane lift the car out of the embankment. They started to secure the car, then waited for the traffic officer to grant permission. Then when he was ready, he was complaining that the crane operators were delaying. It was actually somewhat comical. I’ve inferred that the accident was mentioned during the announcements in the service for the few souls who were unaware, and I have also inferred that we were included in the intercessions during the service. The students’ condolence messages have been pouring in. I’m immensely touched by that: they’ve been very concerned for me, my car, and that I’m enduring this trying moment. The askari were so helpful: I thanked them profusely, and pointed out that in times like this, the bureaucracy can be painful, but their help brought healing. I sent an email to my insurance agent, and she replied. I’m so grateful that we have a way forward. I don’t really know all that it entails: I think there have to be two or three estimates for the insurance company to choose from. I don’t know how long repairs take. I don’t know if they provide a rental car. But we have a way forward, and I have a number of people to consult when my myriad of questions grow. But most of all, I’m thankful for God’s grace upon grace. If something like this had to happen, this was the best possible outcome. No one was hurt. That astounds me. My friend has a small, superficial scratch on one arm, and a bunch of yogurt on his clothes. That’s all. 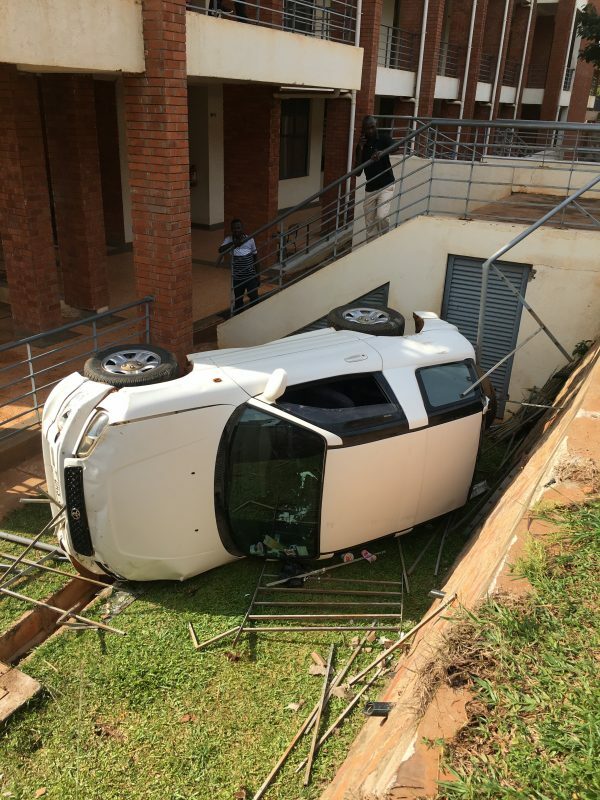 Aside from the handrails, there was no structural damage. The car landed in the best possible position. Everyone was amazingly helpful and supportive. Please join me in praying that this grace continues, and that the integrity and helpfulness of the people involved will also continue. The semester is nearly over, for which I’m grateful, as I don’t know what it will take to bring all this to a conclusion. I really don’t know the steps ahead, and this is one part of living in Uganda that I never wanted to experience. And yet, God’s grace abounds.